Sometimes you need to lift steel or other material that simply can't be damaged or marred in any way during the lifting process. Well, that's what these clamps are for. 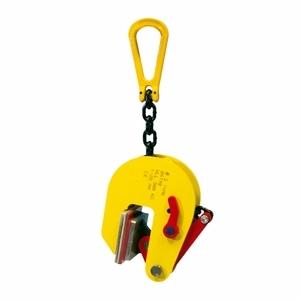 The TNMK series of clamps are non-marring (aka non-marking), meaning they're safe for many types of metals, such as stainless steel, copper, aluminum and even wood or marble. The clamp remains locked in both the open and closed positions. The TNMKA model below is actually adjustable in 0.79" increments, and has a generous throat opening from 0.04" - 7.08". Each clamp is made from quality steel components and is backed by great engineering and a 5 Year Warranty.